I could never see the point of Twitter and resisted signing up. Now somedays I find that although I haven’t emailed, or written on anyone’s Facebook wall, or read posts and lefts comments on blogs – I have “tweeted” through the day. a) Each “tweet” (post) or response/reply is limited to 140 characters. It’s almost a cross between mini blogging, status updates (like on Facebook or MySpace) and a place to chat which can be in real time or like a forum, when you’re ready to respond. b) There’s usually one or two of my contacts around at any one time so I can get *almost* real time interaction. A real person somewhere responding to my questions, ponderings and ideas. My contacts are a mix of people artists, crafters, media types, moms, chronically ill folks and much more including Brits, Americans, Irish, Canadians and Europeans. And *conversation* is limited to these 140 character snippets – which seems to fit with my ME brain pretty well. Now I have to use a client on my PC to make life a bit easier. It alerts me when new tweets come through and if my computers been off it only gets the 20 or so most recent ones. It always brings me replies and direct (private) messages and any tweet that mentions me by name (username that is). And the client on my computer makes easy for me to send replies, check people out, search for things and so on. I use twhirl but there are loads about. 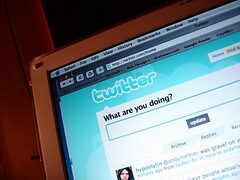 What is not so good is that the more people you get to know the more tweets there are to keep up with and read. Often I have to scan read and a lot of the time if there’s loads I only look at my favourite folks as I scroll through them. But where I am alone for the largest part of my waking day and limited in what I’m able to do (thanks ME) it’s proving a good thing to be using. Maybe it’s seems a bit superficial to have 140 character contact with people (most of whom) I’ve never met – but like blogging, social networks like Facebook, internet shopping and banking, it really helps to keep me in touch with the world outside these 4 walls of the house. You can find me on twitter under my rachelcreative username. 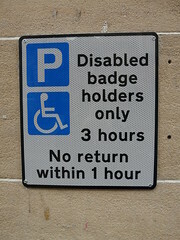 The Blue Badge scheme runs across Europe (and other affliate countries) and allows disabled drivers and passengers to use disabled parking and special parking concessions to give easier access to facilities and services, shopping and leisure, etc. It means that when Growler or my dad take me out somewhere we can actually now park in the disabled bays nearer the entrances to places, with space to get the wheelchair out and (hopefully) not have to tackle anymore blumin gravel car park surfaces. Gravel is not good for those with growling bowels! Now I’m deciding whether to spend £25 on a Blue Badge protector, which is a plastic case for the badge that locks to the steering wheel, as theft of Blue Badges is apparently quite high. I don’t want Growler’s car window smashed for the sake of nicking my blue badge. But in the meantime – we get to park close to places! Yeah! Oh and lots of time for free which is an added bonus (and why theft of badges is so high I suspect). Once again I am sure I owe a debt to my Lovely GP who filled in my doctors supporting bit of the form. In other news I am feeling distinctly wiped out this week. Wondering if the extra bits and bobs of “home alone” is mounting up, or if it’s simply waking earlier than usual, or (improbable but solvable) because I ran out of B12 tablets last week and have had a gap in taking my high B12 dose every day. But I have managed to paint a commissioned piece this week (my brother for his girlfriend’s Christmas pressie and subject matter is strictly secret) so it’s not all bad. Growler has had a hectic week after our washing machine finally died and for the last week he’s been running down to my borther’s to use his machine inbetween making lunch for me and whizzing back and fro from the office. New washing machine due to be delivered this Thursday and I have been in charge of sorting it all out. Dipped into my savings to pay for it even. So even if I can’t actually help DO the washing at least I have made a small contribution to the daily doings of home by researching, purchasing and taking delivery of said appliance. Although Growler has to disconnect the old one for them to take it away and re-arrange things in our back porch to let the men have access to install the new one. And it’s very cobwebby in there so he will have to be extra brave! I am also chomping crystallised ginger in an effort to combat dizziness and a hint of nausea. One good thing is that because I’m not keen on ginger or on that hot burning sensation in my mouth it’s also making me drink lots of water – which is also supposed to good for dizziness. I am itching to start my Christmas shopping (internet style) just to get it done but waiting for next months credit card statement to roll around. I am equally dreading writing Christmas cards but think I should start soon because it took me absolutely ages over many sittings to do it last year. Growler is standing firm about no decorations until at least December :o( but I guess that will be here soon enough! And just over a year after I legally finished my contract with my old work place the Inland Revenue have finally been in touch to see what I’ve been up to for the last 12 months. Big fat zero Mr Inland Revenue. Big fat zero income. I had to tick “unemployed” which really annoys me even though it’s just a technicality. i want a “I’m in limbo” box to tick please. I survived my first week of Growler being out at work full time and me being home alone in the day time. It was definately more tiring (although I am on my period which always leaves me with less energy anyway). But G came home to fix my lunch Wednesday and Thursday. That meant Thursday I could stay in bed until I felt I needed to and not have to force myself to get moving in the morning and sort out my own lunch. Friday he left me things to eat for lunch upstairs so I had another slow day in bed until mid afternoon. It helped both physically and also mentally to know that the challenges do have some solutions to make life easier. My productivity in terms of art and so forth has been quite good despite the extra things I’ve had for essentials (like making cups of tea and silly little things that mount up). But some things have slipped and gotten lost this week – like replying to emails and keeping up to date on blogs I read. I’ve found myself getting distracted by things and then doing short easy stuff like using Twitter to chat but neglecting some of my emails from friends and blogging and stuff. But all of which is part of adjusting and part of seeing a slightly larger picture than a week at a time maybe. Good news is that through G making up my afternoon D-Ribose in juice ready for me and an alarm set on my mobile I’ve remembered to take it every day. I’ve even remembered to take my multi vitamin at lunch time unprompted. I’m weary this weekend and a bit fuzzy pre-migrainey headed so taking it careful. And my brain seems a bit jammed up with STUFF despite going back to making lists of things to do. It’s usually a sign that I’m trying to do too much (ha! you think?!) so some things are going to have to get loosened with my new home alone changes. I expect a lot of blog reading will need to go but we’ll see. All in all not a bad week and I’m fairly optimistic (but still kind of expecting to get myself into trouble at some point and maybe get bitten by some payback for trying to juggle too much). We’ll see. It’s day 2 of changes and I’m starting to see where routine shifts are going to naturally settle. Day one of being home alone 9-5 went well. So well in fact I felt a bit silly for making a big fuss. Growler was home at 5.20pm (with a spring in his step) and there were no dramas. He expertly put exactly enough water in the kettle to last me through the day. Even if boiling 4 cups of water, then 3, then 2 isn’t eco friendly it helped me out on my first day. I even discovered an energy saving trick for pouring kettle into my mug. I made myself a bit of lunch (heated things up) and Growler had left plates and cutlery out for me. I had one wobbly lipped moment in the morning but aside from that I remained positive and calm. I even bravely answered the phone which turend out to be a wrong number. So all in all a good start. Day two and I woke again as Growler was getting ready to leave around 8.30 ish i think. This is 1-2 hours earlier than I normally wake up naturally. I seem to remember this was a difficult thing when he was going out to work last time. So I either have to go to bed at 8.30pm (umm not keen on that) or night try chilling/napping in the day as recommended by my readers. We’ll see. Everything is kind of “we’ll see” at the moment. I have to learn (re-learn) the shape of my day and the feel of it. Waking earlier than usual means I’m getting up a lot earlier than usual. I used to wake at 9.30-10.30 have breakfast in bed, sit and surf on my laptop until lunch. Then if it was a bad day have lunch in bed and get up in the afternoon or if it was an ok day get up and have lunch downstairs. Because I can’t carry my laptop downstairs (safely for me and it) I’ve told G to leave the laptop downstairs for me. That way it will a) give me a good reason to try and get up before lunch anyway and b) make me different things in the morning like drawing and reading. Anyway I’m waking an hour or two earlier and so getting up mid morning and the day – the doing day – seems much much longer. I have time to “do a little something” in the morning whereas before I am was strictly computer only in the mornings and art and stuff in the afternoon. So I have to learn to balance things out better with my 9-5. By 4.30 yesterday I felt I was hitting a wall. i sually only get that if we’re out somewhere, staying with relatives/away for a weekend or on a typical day at around 10pm. So it was a bit worrying. I hope I figure things out quickly as a cumulative effect of hitting the wall at 4pm could be bad news. That or get my mind altered to “do less first and then add more in”. I know how to do this stuff, how to balance and pace and alter my mindset – but I’ve not needed to practice it for a while and I’ve had G to read me and say “it’s bad idea to such and such because you had a rough day yesterday” (me “Oh yer I forgot about feeling bad yesterday”). I had my two remaining wisdom teeth out this last week. The procedure went well and I was with it after the sedation within an hour. But it’s left me feeling a bit out of sorts. It’s hard to put my finger on. I am experiencing dizziness again quite a lot ever since the sedation. Whilst I’ve had dizziness before it hasn’t been a huge day to day symptom this last month or more. So either the sedation, or the “trauma” of the teeth being removed has made me very fatigued, or the sedation itself has had some kind of long lasting effect on my system. But it’s more than dizziness. It’s an almost bereft feeling. Very odd considering how keen I have been to get these teeth out of my mouth for the last year. But I think that feeling if passing. Of course it’s also been a mask to hide behind and to stop me thinking about the major change happening in my life as from tomorrow. Growler has a new job, in an office, 9am-5pm, 5 days a week. It’s good news. He’s excited about the job itself, it’s a year contract of good, steady money and security in times where a lot of companies are wobbling over budgets and freelancers are having to work extra hard to secure work. The organisation has their office locally, in our city, just 15 minutes walk from our house. It’s ideal and it’s a job he’s really looking forward to doing. I think the work, the security and the structure will be really good for him. I’m so proud of him and so excited for him. The excitement is mixed with some trepidation about how my own 9-5 is going to work out. I’ve spoken before about the fine balancing act of positivity/hope and practical/realism. I’ve had 2 family members being super positive and suggesting the structure might be good for me too. That it might give me the incentive I need. Growler says this is out of well wishing and positiveness on their parts but I can’t help but feeling a sting that anyone should think what I need is motivation. That if I am forced to get up and make my own lunch that will help me to get better. This just suggest they don’t really understand the reality of my illness. But I shan’t dwell on that for now because I am trying to think positive too in the face of major changes to my life and care. My fear for myself and spending the majority of the day for the majority of the week alone and without practical support is only matched by my fear of how Growler is going to manage balancing a full time job with caring and looking after the house. It’s unknown territory for both of us. I get the sense from my parents and his that their most worried about him, but that might be because no-one wants to press me on how I am going to cope. So my breadwinner is off to win regular bread and together we’ll muddle through a new way of living with ME/CFS. I am incredibly fortunate not only to have a supportive breadwinner but to have had the luxury of having him here, on hand nearly every day for over a year and a half. I love hanging out with Growler. Having him around every day has been a joy and helped normalise my world within these 4 walls of the house. I have to think of this as a foundation for what lies ahead and try not to dwell on the upset of losing it. It might mean I blog more. Being alone a lot of the time. It’s certainly going to present me challenges both in my day to day living tasks and in my marriage. What I want is to be the supportive spouse and send Growler off to his new employer with no worries except focusing on a new job. But I can’t seem to set aside my own overwhelming sense of fear and loss of what the future holds. Of being scared that all the tiny extra’s of effort, all the things I forget when left to my own devices (how much is too much, when to drink, when to eat, how to keep perspective) will gradually wear my health away and leave me useless. Leave me being more a burden. Yet the fear and the worry is self feeding – because worrying about it makes me feel ill! I can see how from the outside this could all seem like low self esteem, depression maybe, being dependent on my husband for every little thing. That now with the “incentive” it will make me better. But truth is I AM dependent on my husband for a lot of things. That doesn’t mean it’s wrong, or bad for my self esteem, it means I am chronically and severely ill. I don’t rely on my husband to make me cups of herbal tea and bring them to me in bed because I can, because I am lazy, because I choose not to do it myself. It’s because to make the tea myself means a whole complex set of weighing up of efforts over reward that usually means no herbal tea for me. Because it’s not just about a teabag in a cup – it’s about moving out of bed, moving dowstairs to the kitchen .. the stairs being a huge effort this is minimised to once up, once down a day if possible so the move to make a cup of tea means first getting dressed, getting washed perhaps, gathering what I need with me (medication, phone and so on), resting inbetween these things, resting once down stairs, then maybe thinking about how to get water in the kettle … and so on. If it were as simple as relying on my husband just because I can – I can promise you I’d be choosing to make my own tea. So it seems a part of the pain and fear is the perception of the outside world. Perception that I am more capable than I show – do I have to make myself more ill to prove to them I’m not? Perception that with the right kind of motivation I’ll find I can do more – will they recognise the things I have to not do in order to do the essentials myself? And really what they THINK doesn’t really matter. All that matters is living my life the best way I can. Finding the compromises that work the best for me, for me and my husband. Finding ways to be happy and to not wreck what level of function I do have. Finding ways to keep my sanity, my perspective, my sense of self. And trying to balance self care with not making myself worse. Balancing my own happiness with my husbands. Trying to balance security and regular income and my husbands job satisfaction with the challenges of being a person with ME on their own 8 hours a day, 5 days a week. Trying to drag myself away from the fear and to get on with the living. My head is stuffed full of things – but there doesn’t seem to be much sense coming out. I’m not sure I wrote the blog post I wanted to, because now even I’m confused about what I want to say. But that’s part of what I’m saying. I’m a mixed up with thoughts and mixed up because ME makes my thinking cluttered and fuzzy and whizz around in a circle even once a conclusion has been reached. I expect more rambling blog posts will follow. New stuff is added all the time.